and decided to make a table runner with it! been know to use hot glue to finish edges! I then decided how wide I wanted my ruffles and cut a strip of coordinating fabric. I am definitely not the sewing contributor because I don’t measure anything!! I eye-balled a straight line and threw in some pins to mark where to put the ruffles. 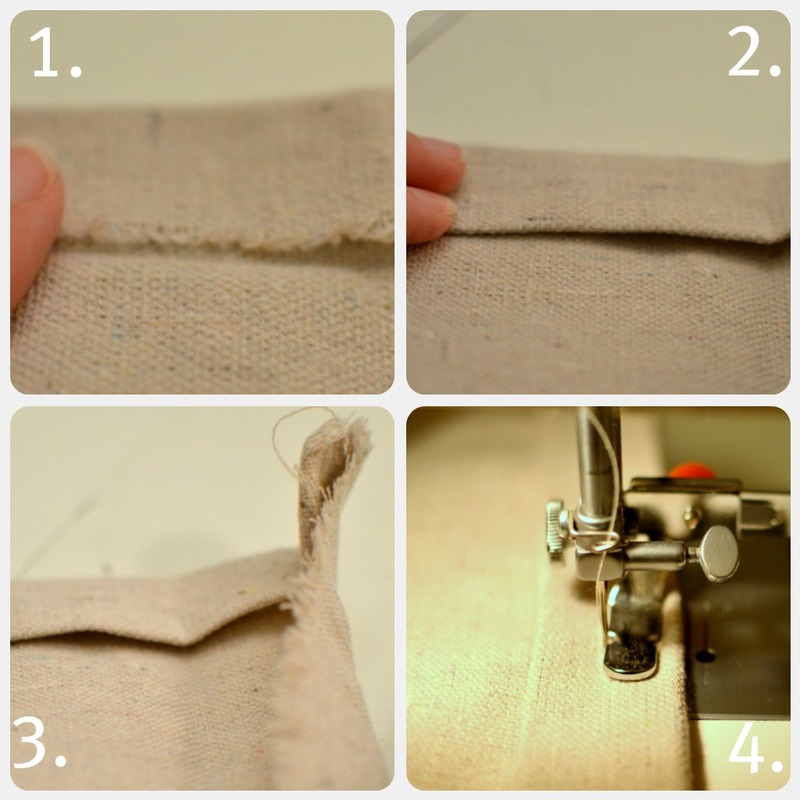 and sew over it…no measuring, all eye-balling! sewed right over the end the make it look like a “finished” edge. and blue for summer or red and green for Christmas. I’ve also used fabric sewn on burlap! used scraps of drop cloth leftover from my slipcovered chair. I just love that it’s an inexpensive way to get a very custom look for your home! I love finding inexpensive ways to make your home a beautiful place! I love it, the green & yellow are perfect for spring and it’s easy enough that even I can do it. I love drop clothes, but I really love the splashes of color you added to yours! So pretty. I love that! I can easily do this at home. Thanks for sharing! Love this so cute with the ruffles, plus the drop cloth makes it so durable. Cute and simple Nicole! And way to admit you’re not the sewing expert 🙂 I always have wrinkles too, I hate getting out the iron! I like how you put the ruffles at the end, and not straight down the middle because then plates wouldn’t lay flat when you actually dine there. Thanks so much everyone! 🙂 I was afraid that no one would like it!! Your sweet comments are AWESOME! So cute!! The yellow and green fabric looks fabulous and I always love ruffles!! This is so beautiful! I wish I had a nice table I could make this for! I absolutely love the Spring colors! That’s such a great idea to add a splash of color to the table! To make all this you should have a creative mind as Jen have. Such a nice use of cloth.